In 2004, comic book movies were still being defined. With only a handful of movies beforehand (excluding Superman and Batman), the canvas was still pretty blank. Spider-Man 2 changed all that. With a visionary director at the helm to continue his previous creation, Sam Raimi reminded us what it felt like to be excited about going to the movies again. Spider-Man  was really good, and everyone knew it. Its sequel was undisputably one of the most anticipated movies in the history of film. Little did we know what we were in for. A masterpiece. 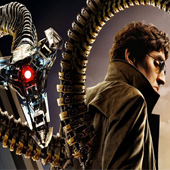 The inner-struggle of Peter Parker, the visually stunning mechanical arms of Doc Ock, the commanding score by Danny Elfman: all brought together a woven “web” of genius that built upon (and in my opinion, established) the cornerstone of comic book movies for years to come. Join the guys by hitting play below as they talk about one of their most beloved comic book movies of all time. And thank you, Sam Raimi. Thank you.